The 90s K-Drama ‘War and Love’ was and still is amazing. Choi Ji Woo, an actress who rose to fame after her debut through that series, is the one of whom we are talking about. Starting in the mid-90s, she has gained massive fans and followings till date. Now let’s know more about K-Drama actress Choi’s information and facts through this wiki! Born on 11th June 1975, Choi Ji Woo (최지우) is an actress. Her birth name is Choi Mi-Hyang but is more famous by her stage name Choi JI-woo. Her hometown is Paju in South Korea. She holds South Korean citizenship and is of Asian ethnicity. Her zodiac sign is Gemini. She completed her academic qualification for Aerobic Dance from Pusan Women’s College and Hanyang University for Theater and Films. Choi is one of the famous actresses from South Korea. Her talent was first discovered in 1994 when she won talent audition organized by MBC and debuted from the drama series War and Love in 1995. In the same year, she was offered a lead role in 1996 film The Gate of Destiny but was later replaced due to her limited acting skill. Her contribution in K-Drama industry includes notable series like Love, Love Story, Truth, We are Dating Now, Winter Sonata, Full House, RONDO, Air City, Winter Sonata Anime, City Lovers, Temptation, We Broke Up, First Seven Kisses. Choi also worked in several movies including The Hole, First Kiss, Nowhere to Hide, Everybody Has Secrets, Now and Forever and Like for Likes. In the year 2013, she was the host of the show Choi Ji-woo’s Delicious Korea. For her contribution in K-Industry, she has won several awards like 14th Gloden Disk Awards for ‘For Your Soul,’ World Tourism Cities Forum for Top Popularity Award, 7th Asia Model Festival Awards, SBS Drama Awards, MBC Drama Awards and others. For a celebrity, earning handsomely is not a rare thing. As of 2018, Choi’s net worth is estimated to be $15 million. Ji Woo was once in a relationship with South Korean actor Lee Jin Wook. The duo met in 2007 through MBC’s “Air City” and started dating in 2009. Both were open about their relationship. They were covering media spotlight and had uncontrolled attention by the press. Moreover, that was the reason for their breakup. Choi ended her three years long love life in 2011. Again in 2015, Choi was rumored to be dating her co-actor Lee Seo Jin. The two appeared on the show ‘Grandpas Over Flowers’, and their chemistry spread dating rumor. However, she addressed the news and revealed Lee to be just a good friend. On 29th March 2018, Choi finally stepped up for marriage. 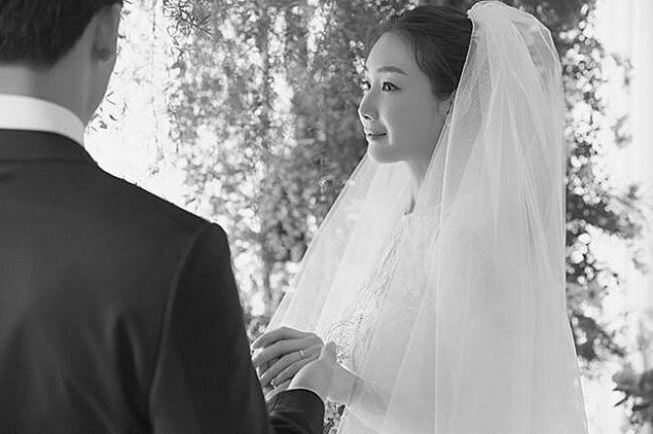 According to the statement released by YG Entertainment, she turned her boyfriend/fiance to her husband in a private wedding ceremony. The report also mentioned that the duo turned a year-long love life into married life. Moreover, the agency revealed her husband to be the one, far from the entertainment industry. 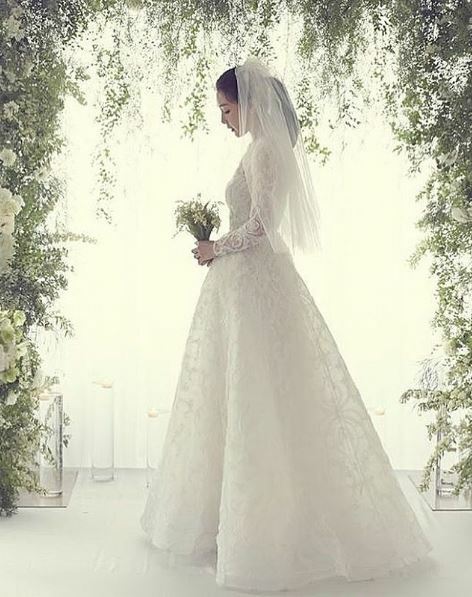 In her wedding, Choi wore a designer bridal dress by Ashi Studio’s founder Mohammed Ashi. The agency uploaded her bridal dressed picture after her wedding. “I feel shy and nervous writing a letter for the first time in a while. It’s a bit sudden, but I have great news. I tied the knot on March 29 with someone I want to start a new life with. We held a private wedding ceremony with only our close family members in attendance. I will start a happy family with the person I love, and we will always respect each other. “I should’ve let you guys know earlier, but I wanted to be careful because my [husband] is not a public figure. I hope you will understand and give us your blessings. I will always remember the love and support you have given me, and I will continue my career as an actress. Choi is one of the beautiful and talented actresses with a sizzling personality. She is slim in figure measuring 32-23-32 inches. She is decently tall with the height of 5 feet and 8 inches and weighs about 50 kilos. Her eye and hair color is black, and skin is white as she belongs to white Korean ethnicity.